Abiodun Omowunmi Essiet has graduated from three Coady programs since 2016, and is now completing the Coady Women’s Fellowship. Abiodun is a certified midwife and public health nurse, with a Bachelor’s degree in Nursing Science and a Master’s in Public Health. She is the Executive Director of Abiodun Essiet Initiative for Girls, a leader of the Nigeria women Trust Fund, and the National Director on Women, Gender, and Development Affairs of African Youth for Development Commission (AYDEC) Nigeria. In 2018, Abiodun became the first woman to contest for the office of councilor in her ward in its 23 years of existence. 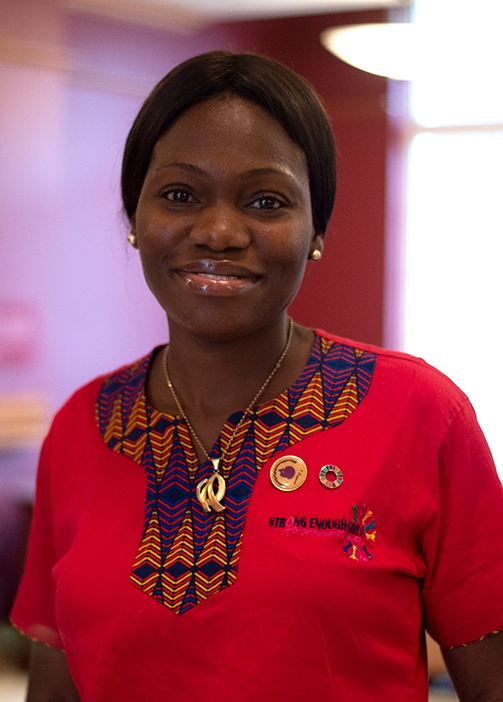 As a woman running for political office in Nigeria, Abiodun has faced many obstacles. Aboidun believes that her run for political office adds a missing voice in the male-dominated field, and she is aware that leaders of the future are watching. “A lot of young people, they see me on social media or read about what I do, and they want to be like me,” she says. To those future leaders, Abiodun says that it will take strength and perseverance, but that change is possible. “The road may be rough, but you should always remember that quitters don’t win,” she says. “Be resilient, because our gender alone has mapped out a battle for us, but we have to believe in ourselves. As part of International Development Week (Feb 3-9, 2019), and every day, we thank Abiodun and all who work “together for gender equality”.